As usual, my life is a series of Ups and Downs. For instance, now that my workday starts and ends earlier, I have two new situations to deal with. Pro: In the morning, it's wonderful to sail down the empty streets and 11 minutes later be parking in any choice spot at the hospital parkade. Con: When I leave work early in the afternoon, I get stuck behind the sluggish parade of senior drivers struggling to make it home before the real traffic starts again. I swear Blue-Haired, Hat-Wearing Retirees come out the moment morning rush hour ends and leisurely monopolize the streets at 20 Km/hr until afternoon rush hour begins in earnest. But can I politely honk BHHWRs to move over to the slow lane? Noooooo.... I wouldn't risk inciting a heart attack. And with street parking still legal at that time of day, I can't swing around them either. So I crawl home behind the lethargic procession, swearing silently and darting dirty looks whenever I can. All in vain of course, as my frustrated expressions will never be acknowledged by BHHWRs in thick eyeglasses who can barely peer over the steering wheel of their monsterous vehicles. ... or if it was a warning to steer clear. I love vanity plates. I was driving behind a beetle bug the other day with a license plate that said "eew a bug" It made me laugh. I'm thinking it's a warning. MUST be...lol...I'm surprised you dared get close enough to take a picture of this one! You are one brave bloganista!!!! I was going to say the same thing. Either you were right on their bumper or you have one heckuva zoom lens! My wife and I walk in the morning before work and our path takes us right past our hospital. Around 6:55 the people who are late for work come screaming past us at 100 mph. We have to make sure we're way up on the sidewalk so we don't get killed. Although if we do get hit, at least we'll be nice and close to the hospital. So there's that. 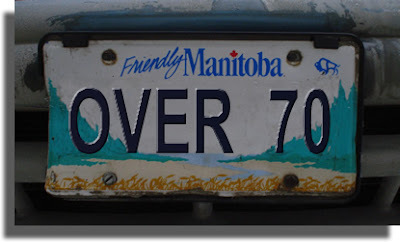 Over 70 would be a good license plate for me too. Actually it's usually over 80. That plate is awesome. I work downtown and while I don't deal with senior drivers I have to deal with "tourist" drivers. I totally feel your frustrations. Marsha: (do you know how hard it is NOT to type "Marsha, Marsha, Marsha"??? Ooops, I guess I just did. And you'd have to be about my age to catch that Brady Bunch reference). Anyway, aw, thanks. But I HAVE to tell my daughter about that beetle plate... that's hilarious! Jeff: Yeah, hospital workers late causing accidents... perhaps it's a form of job security? Toners: Ha! I think I would go KERAZZZZY there... and sadly, most are Canucks. Diesel: I TRY to go 80, but the damn traffic gets in the way. ShannanB: Oooh. Tourists. Luckily, no one wants to visit Winnipeg, so I don't have to deal with that. All our tourists go to the lakes around the city instead. I see these folks once in a while down here in the Southwest, but rarely. Many retires move here for the weather and the heat, but they don't last long on the roadways. With unbridled growth and little social services (read that no law enforcment), people drive as fast as they want (we have an unwritten law here, that says you can't be cited for speeding of you are going with the 'flow of traffic', if everyone else is doing 90mph, you can do 90mph). This forces the seniors off the roads pretty quickly, out of fear. Most of them wall themselves up in little retirement communities and rarely venture out into the mainstream populace. Sad, but true. Clearly, steer clear. When bingo lets out at the church up the street, I stay safely inside my house. ROTFLOL! Yet again you have me in stitches with your writing! Having visited the 'Peg many times (I was born there, so I can't be called a "tourist"! Ha!) I can attest and vouch for what you are saying. I was very proud of my late grandpa when, at 80, he took a bus downtown to the licensing office and voluntarily turned in his license. He was always a very good, cautious driver, but found he just wasn't comfortable driving his aircraft carrier of a car down Portage Avenue with all the much smaller cars zipping around him. I'm sure he felt the loss of his mobility keenly, but I think it took great courage to do the right thing. Loved the Beetle plate too. My grandmother used to see someone she knew and stop in the MIDDLE of the road (not one lane or the other) to talk to them. This is HOUSTON mind you! Anyway...looks like a warning to me! Either taht or I'm with Ve. :-) Funny one Marsha!!!!!!!!!!!!!! HA! That plate cracks me up!! Momo Fali: Yeah, you gotta watch out for those bingo ladies for sure!!! Huckdoll: I just hope my parent don't read this; they're over 80! Phoenix5: Har! Good for Grandpa! I swear they need to re-test everyone after the age of 70. Jill: Well, I guess when you reach that age, you feel like you can do anything you damn well please! Ann(ie): Yeah, it was unique, that's for sure! Seriously...I think once you reach 70 you have to take the driver's test every year because it seems 90% of elderly people should not be out on the road. Case in point, the Cold Stone Creamery near my house, a half hour after my husband and I left it happily full of yummy ice cream, was demolished by a little old lady who mistakened the gas for the brake. Luckily she did not hurt anyone when she plowed right through the front plate glass window. VP: Yikes! Good thing you had left already!!! Just proves my point even more. Fantastic Blog! Keep it coming. Nice to read that we don't have these issues only in my country. Have a fantastic Feastive season. Thank you Richard! Happy Holidays to you too and welcome!